● For hotel-only bookings over $550, you can make a first payment of $100 and two equal payments later (some restrictions apply). ● BookIt offers a best rate guarantee: If within 24 hours of your hotel booking you find a better rate than that offered at the site, Bookit will match it and give you a 10% coupon (up to $200), for use in future bookings. ● Discounts of up to 77% are available for all-inclusive vacation packages. ● Usually, BookIt offers coupons for hotel stays from three nights up (they can be for any hotel or for selected locations). Travelers hoping to save money on their next vacation, trip, or even just entertainment in their own local area will want to investigate all of the different packages available through Book It. This online service helps connect individuals from around the world to vacation packages, discount hotels and accommodations, luxury cruises, first-class flights, and rental cars at significant discounts free of charge. Travelers only have to use the Book It online booking tool to arrange their next vacation or getaway, and they'll be able to take advantage of all the special packages, special deals, and special discounts that they are able to make available from their travel partners. 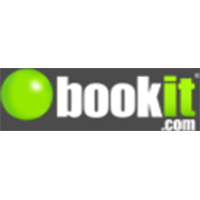 For most up to date offers check out Bookit on Facebook and Twitter or contact Bookit Support for any questions.